It all comes back to the basics. Serve customers the best-tasting food at a good value in a clean, comfortable restaurant, and they’ll keep coming back . − Dave Thomas, CEO of Windy’s, a fast-food restaurant chain. The efforts of housekeeping speak for themselves. The result of sincere as well as faux housekeeping efforts are noticeable. The housekeeping staff needs to execute cleaning and maintenance tasks at various places inside the hotel. The most important task is cleaning and maintaining guest rooms and guest bathrooms. The guests assess the cleanliness in this area critically. By following the best cleaning and maintenance practices, the housekeeping staff can contribute to retain the satisfied guests as well as to generate new guests willing to repeat their visit to the hotel. This brings in more revenue to the hotel business. To perform towards guest satisfaction and work productivity together, the housekeeping staff needs to structure the cleaning and maintenance procedures and follow them appropriately. 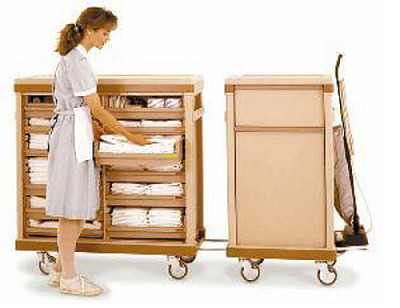 The chambermaid’s trolley can be viewed as a large tool box on wheels to aid the hotel housekeeping staff. It has a number of compartments and shelves of various sizes. This trolley is filled with the supplies from the housekeeping supplies store at the end of each shift so that the next shift staff can access it immediately. The staff considers the following points while loading chambermaid’s trolley. Loading the trolley with adequate supplies depending upon the number and types of the rooms on the floor. Avoiding to overload the trolley that may lead to any accidents. Avoiding to underload the trolley that may lead to make unnecessary trips to supplies store. Check rapidly for any broken parts. Clean it by dusting and wiping any stains. Place the items according to their weight: heaviest items at the bottom and lighter items at the top section of the trolley. Place the linen for different purpose separately. Close the lids of cleaner bottles and liquid cans tightly. Record the numbers and types of the items loaded in the trolley for the rooms. Take the trolley to the assigned duty floor. Park it outside the room such that the linen side faces outside and the room entrance is blocked. The housekeeping staff should follow the SOP given below for entering the guest room. Leave the DND (Do not Disturb) rooms undisturbed. Knock the door with knuckles and announce in pleasant voice, “Housekeeping…”. Wait for five seconds to hear the guest’s response. In case of no response, announce the same again. In there is no answer second time too, open the door with the key. If the guest is found sleeping, withdraw from the room quietly. In case the guest answers, ask politely when would he like to service the room. In case the guest wants it later, acknowledge his reply and withdraw from the room. If the housekeeping work is in progress and the guest returns from outside, greet him and ask if the guest would like to return in some time. Not use guest room linen as a door stopper or for cleaning and dusting the room. Keep the guest room door open while working. Open the curtains and patio door. Assemble the furniture and place appropriately. Keep the vacuum cleaner and other cleaning apparatus in the room. Check the type of bed. Take the bed linen of appropriate size and place it on the nearest chair. Remove previous bedspread and place on the chair. Inspect the bed and pillows for their condition as well as for any lost-and-found. In case of checkout room, deposit the left guest items to the floor supervisor. If the room is still occupied by the guest, place the item such that it is safe as well as visible to the guest. Put soiled sheets and pillow covers in the soiled linen cart of the trolley. Empty ashtrays and rubbish from the guest room and bathroom dustbins into the trash cart of the trolley. Pick up used glasses, mugs, ashtray, trays, and place them on bathroom platform. Spray the bathtub, basin, glasses, mugs, and trays with cleaning liquid. Let them soak the chemicals from the liquid. Start dusting from an extreme inside corner of the room and work outwards. Sweep the room and patio floor. Mop the room and patio floor. Clean the glasses, mugs, and tray. Sanitize glasses, mugs, telephone device, and TV remote. Inspect the condition of bathroom slippers and bathrobe. Replace if soiled. Close and lock the room door. Report any damage spotted to the supervisor. The SOP for cleaning the guest bathroom is given below. Scrub and finish the platform, bathtub, and basin. Scrub and finish the toilet bowl, rim, ring, and hinge. Clean bathroom walls using wet mop or sponge. Replace amenities such as toilet roll, toilet block, shampoo, conditioners, and moisturizers. Wipe down shower curtain working from top to bottom with a dry cloth. Replace bath towels and hand towels. Keep the bathroom door open after cleaning. Check bathroom doormat. Replace if required. The balcony or the patio are the extensions of the guest room. The SOPs for cleaning them are given below. Clean the door tracks appeared on the floor. Every room has to be entered at least once a day by any housekeeping staff. The guests who do not want to get disturbed by any housekeeping service tag their rooms with a Do-Not-Disturb (DND) sign. The SOP for these rooms is as given below. Do not disturb by placing a call until 2:00 o’clock in the noon. After 2:00 p.m., the Supervisor calls the room to know the guest’s needs. The housekeeping staff contacts the supervisor to make sure whether to service the room. If the call was not answered by the guest after two calling attempts, the room is serviced. To his best judgement, the housekeeping staff enters the room and continues with the usual housekeeping work. Carry out the lift cleaning task early morning when the least number of guests are expected to use it. Call the elevator on the ground floor. Put appropriate signboard near it. Clean the lift using the appropriate cleaning liquid according to the wall material of the lift cabin. Work from top to bottom while cleaning a lift cabin. Keep the lift door open till the floor and walls are dried completely. Clear all ashtrays into the trash ensuring no cigarettes are burning. Clean and restore them to proper places. Clear the dustbins near front office desk. Replace their lining and keep them as they were. Dust and wipe the telephone device, fax machine, Computers, and kiosks. Sanitize the telephone device, computer key board, and touchpad of the kiosk. Remove spider webs from ceiling. Remove the dust deposited on walls, windows, furniture, and floor. Remove stains on the carpet and furniture. Clean all artifacts using damp and soft cloth carefully. Sweep and mop the flooring of lobby and front office desk area. Dust and polish any vases, paintings, and art pieces. Spray the air clean spray with signature aroma. Play a very light and soothing instrumental music. Control pollutant discharges occurring from broken drainage or water systems of the hotel. Remove fine-grained sediment particles on parking floor. Clean the area near lift. Hard-sweep the parking floor using street sweeping equipment. Collect and dispose the debris appropriately. Bringing presence of any unusual debris to the notice of public area supervisor. Water the plants regularly according to the season and requirement of the plants; generally early morning. Remove the weed and fall leaves daily. Implement the art of Arbosculpture to enhance the beauty of the trees and bushes. Keep the gardening tools clean and safe. Report any damage or requirement of tools or plants to the public area supervisor. Keep the lawn grass in healthy condition by periodic cutting with the help of scarifying machine. Keep any artificial waterfalls or artificial water body clean. Fertilizing and manuring the plants as per the schedule. Recycle the food wastage in the hotel to prepare organic fertilizer. The dining areas need daily cleaning before their working hours start as well as when the restaurant staff requests cleaning. The SOP is given below. Collect all the cleaning equipment and dining area keys. Switch on all the electric lamps. Open all the drapes and blinds for letting in the natural light. Observer the entire area to plan the work. Align all the chairs away from the table to make room for cleaning. Clean the carpet area, using vacuum cleaner. Remove any food stains from the carpet using appropriate cleaner. If there is no carpet on the floor, sweep and mop it. Dust all the furniture in the dining area. Polish the furniture if required. Using a feather duster, dust all the pictures, paintings, artworks, and corners. Clean and disinfect the telephone devices. Polish metal, glass, and wood items if required. Clean the mirrors and windows by wiping them with wet sponge. If requirement of maintenance is spotted, consult engineering department. If any guest items are found then deposit it with housekeeping control desk. Collect all dirty table linens and replace with the fresh ones. Return the keys to the security department. Record in the housekeeping register. Check water quality more than once a week. Check any broken tiles/pipes inside the swimming pool. Clean the water as soon as possible when required. Check the pool water for contamination daily. Remove leaves using leaf catchers. Check for slippery floor area and the pool bottom. Apply and maintain the anti-slip mats near the pool. Scrub and clean the bottom of the pool. Keep the life-saving and floating apparatus ready all time. Keep poolside area and basking chairs clean. Keep an appropriate and noticeable signage showing the depth of the swimming pool. Check and keep changing rooms up to good quality. Keep the changing room door open when it is not occupied. Employee lifeguards to provide general safety check for swimming pool once a day during the operating hours. Add adequate amount of chlorine in the pool water. Tag the room as "Not for Sale". Remove the guest amenities, curtains, and art pieces from the room. Send the curtains to the laundry for dry cleaning. Empty the mini bar and send the beverage items to Food and Beverage store. Roll the curtains and cover them with dustsheet. Inspect the furniture and send to the furniture yard for repair or upholstery. Inspect the locks, knobs, latches, leaking pipes, and bathroom. Hand over the room to maintenance department for any painting, sealing, and repairing work required. Once the maintenance work is complete, remove any residual smell of paint and varnish by airing the room. Polish and clean the permanent fixtures. Open, lay, and shampoo the carpet. Check the bathroom sealing and clean the bathroom. Make the bed using fresh bed linen. Restore the art pieces, furniture, and guest supplies. Call room service for restoring mini bar, glasses, and trays. Show the room to the floor supervisor. Release it to the front office desk for selling. Empty garbage bags of the chambermaid’s trolley into the garbage receptacle. Ensure they the soiled linen collected into chambermaid’s trolley bags are sent to laundry. Remove the chambermaid’s trolley and check it for ant damage and dirt accumulation. Empty the vacuum cleaner bags and replace them with new ones. Tidy the housekeeping department area by stacking the items at their appropriate places. Clean the toilet brushes with hot water for ten minutes every week. Rinse mops in light detergents and hang for drying. Close the doors and handover the keys to the housekeeping control desk.